Grieving Mirth hail from the border in between Mexico (Nuevo Laredo, Tamaulipas) and the U.S. (Laredo, Texas), formed by Mexican guitarist Abomination (Luciferian Rites, Demon Kultur) and North-American key-master Adversor (think Nethermost, Mysteria Inframundi, Wraith Of Extinction), and nowadays extended / strengthened by English blood (vocalist D.H., formerly of Criptum-fame, and nowadays involved with e.g. mighty A Monumental Black Statue). Both original members recorded the instrumental part of this album, what would become the debut, in 2011 and early 2012, but things didn’t turn out the way it was supposed to be. At last, in September 2014, the vocal parts were done in London, and the band independently released this first effort the digital way at the very end of Winter 2014. Then they signed to Loud Rage Music in order to have this stuff released on CD as well. And for your (futile) information: the bass lines were recorded by Luciferian Rites-colleague Gerardo ‘Serpentor’ Vazquez, while the clean vocals have been provided by mixer / master Marco Santini. 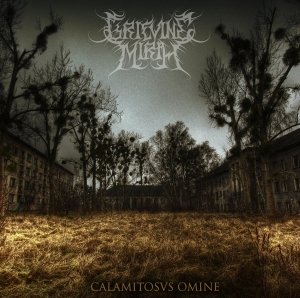 Calamitosvs Omine lasts for twenty seven minutes and it brings a standard form of melodic and rhythmic Death / Black Metal. In general the whole sounds pretty universal and timeless, yet for sure there is a certain modernistic approach that penetrates a core of pure tradition. Doesn’t this sound sweet? Well, actually, that’s the thing that bothers me the most. At the one hand, you have, once again, great tracks, based on persuasion, executed through craftsmanship, elaborated with honesty and pride. But then again, the f*cking lack of some (read: any) own-faced identity, the lack of outstanding thrills, it does irritate me as well. Okay, irritation is not an appropriate description, I have to admit, because this material is, as mentioned in one way or another before, not that bad at all. But sometimes the equilibrium in between qualitative high standards and originality balances towards the opposite. I am afraid that this time, my personal balance needs more counter-weight.